Originally designed for comfort during round world cruising, Oriana’s broad teak promenade and lido decks are great for sun bathing and watching the world go by. The card room and wood panelled library are ideal for relaxing in, as are the bars. 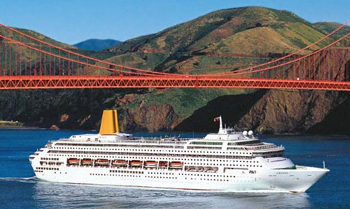 View all Oriana cruises or view more options for P&O UK cruises. There are plenty of daily activities on board to keep you busy with bars, pools, sports venues and shops; you can relax by the pool or catch a film in the dedicated cinema. Holidays offer an important opportunity to take stock and revitalize. With some time to yourself to do as you please, you can discover a new sense of well-being. On Oriana you will find an ocean view gymnasium, fitness classes and sparkling pools to help you stay healthy. Wholesome choices on the menu in the restaurants and buffet courts ensure your best intentions need not flounder. Activities from deck quoits and shuffleboard, to deck tennis are bound to keep you on the move. And if you simply need some time out, then Oriana’s jacuzzis and spa facilities are certain to soothe away all your cares. You’ll find The Oasis Spa and salon offers the chance to spoil yourself with a treatment, a new haircut or a makeover. So you might just discover a new you. Choice is the order of the day on Oriana. With a dedicated cinema, theatre and show lounge there is something for everyone. Theatre Royal:A traditional theatre colour scheme of rich red, blue, gold and maroon, combined with a Shakespearean Tudor rose motif and heraldic design, was employed to give the feel of a West End theatre. Pacific Lounge:Soft comfortable furnishings and contemporary colours create a friendly and inviting feel in the Pacific Lounge, and a tiered floor offers excellent viewing from anywhere in the room. Chaplin’s Cinema:Sit back and enjoy the latest blockbusters or your favourite old classics, which are shown throughout the day and evening. Chaplin’s is also used for lectures, port enhancement talks, and much more. Harlequins:Harlequins has an in-laid, wooden sprung floor, which offers a large open space that’s great for ballroom dancing during the day. In the evenings, the floor area is reduced to a small intimate space for fantastic late night disco dancing action. Monte Carlo Casino:The Monte Carlo Club is the perfect place for roulette, blackjack and poker. Enjoy two main restaurants offering a choice of Club Dining – the same table at the same time each evening – or Freedom Dining with no fixed seating or dining times. There is also the opportunity to visit the Select Dining venue of Sindhu, the first restaurant at sea from master of spices Atul Kochhar. Or you could try Al Fresco, a delightful Italian-themed buffet that is perfect for a lighter breakfast or lunch and is unique to Oriana.